The 11th Panchen Lama is talking with Tseten Namgyal. In October of 2006, "Treasures of the Chinese Nation, an Exhibition of Tibetan Culture" was held exclusively at the Capital Museum in Beijing. Over 200 exquisite Tibetan cultural relics and 100-odd Tibetan folklore images unveiled in the exhibition hall attracted endless lines of visitors. While monks were busy making Mandala, a painter was sketching Thangka in the hall. In conjunction with the traditional art show in the exhibition hall, the visitors were profoundly inspired by such unique demonstrations of Tibetan culture. A middle aged Tibetan man glimpsed in a corner, wearing Tibetan robe, magnetically drew visitors. He was sitting cross-legged on a small carpet and boning up on drawing Thangka. A vivid image of Buddha, surrounded by precious flowers and clouds on the Thangka, gradually appeared. The man was the Tibetan folkloric painter - Tseten Namgyal. 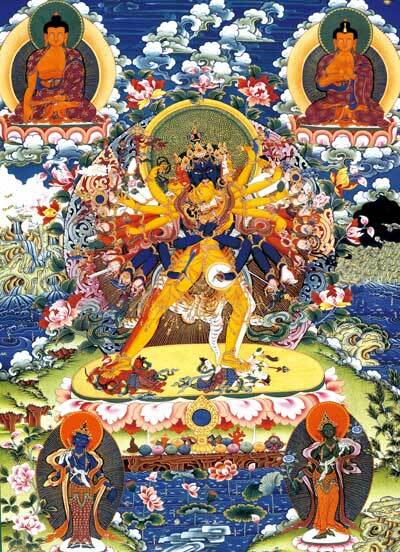 Standing in front of the Thangka, a young woman said excitedly: "What a wonderful picture! Looking at the eyes of Buddha, I could not speak. It is just like the Buddha is talking to me right this moment, and seems there is something piercing my heart". Tseten Namgyal and his paintings became one of the high lights in this exhibition. My father told me I was born about ten months after my mother got pregnant. He was so anxious and afraid of losing both my mother and me due to my later birth. Eventually, my birth brought excited him. In accordance with Tibetan culture, having a son implies a birth of treasures. I was given the name Tseten Namgyal ?C a typical Tibetan boy's name. Tseten in Tibetan refers to safe and Namgyal to victory; my name implies my parents wish my whole life to go safely and easily to great achievements. I resembled my father in facial appearance, but I copied my mother's personality. I took care of my brothers when I was a kid, and studied Tibetan language when I was 10 year-old. But soon I had to drop out of school and then looked after herds because of the family's difficult financial situation. I still remember that I was used to living with my brothers and sisters at a same room. We usually slept together as two kids with one cover; the cover was handmade from sheep wool by my mother. With too many kids, my family was quite poor during that time. We could only eat Tsampa; having fried potato was recognized as a happy life by us. I was actually the elder boy in the family and naturally shouldered everything for my parents, such as taking care of yaks and sheep and carrying animal dung for the farm. I was paid 13 Yuan as my salary by the farm, and submitted all of it to my parents. When I was 15 years old, I drove a tractor for a salary of 23 Yuan and 30 Jin (15 kilogram) of Tsampa and one Jin of yak butter. But soon after, the salary system was called off and replaced by the score system. This change made our family more impoverished and my brothers had to go to monasteries to be monks. Next, Tseten Namgyal started to learn to be carpenter. He said he was fond of drawing picture when he worked as tractor driver. Whenever or wherever he was, he was used to picking up a wood stick and sketching pictures on the ground, such as tractors, yaks, sheep, chickens, pigs, blue sky with white clouds, and mountains. Keeping on drawing, his pictures resembled reality very much. Once he made a box for Chema, and intended to paint something on it, but there was no pigment available. What could he do? He cleverly took chalks in various colors, blended as powder, and then mixed with water. Though painting with such pigments made his picture look awful, he was still very excited. Gradually, he painted on his furniture while he was acting as carpenter. 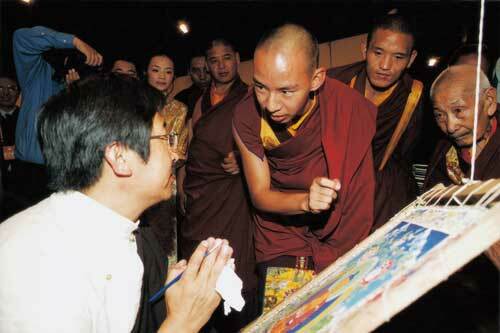 One day, he was very happy because his parents praised his painting on the Tibetan table. Staring several times of the table, he found, in fact, it was a success. 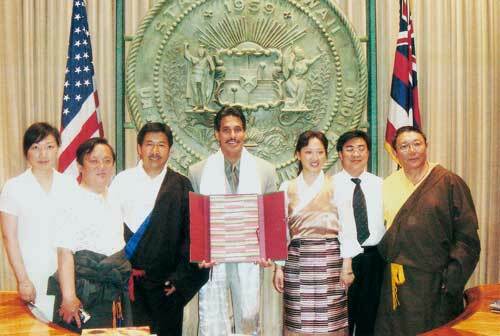 Currently, the table was still kept in the house of Lhundrup County ?C the hometown of Tseten Namgyal. One day, I went to Lhasa to purchase pigments, and by taking chance I visited Nyingchi. When I was there, I made a big decision to draw pictures on furniture for families. Tibetan furniture was very popular in that time. I could make 25 Yuan by drawing pictures on a square table, 30 Yuan for a rectangular table, and 45 Yuan for a cabinet. Within one week, I painted several cabinets and tables. I sometimes stayed outside over one month because I was sick of waiting for a bus at the early morning and late at night if I went back home everyday; it always took me two days to get back to Lhundrop. I still remember, once I took 600 Yuan of my earning to give to my father. The biggest piece of currency in that time was 10 Yuan and the other was only one Yuan. My father was so excited and counted all of them throughout the whole night. Eventually, he became confused. During that time, if a family owned a radio recorder, it was recognized as a rich family; and if owning a bicycle it was regarded as a wealthy family too. By taking the chance, I became rich because I owned bicycle, radio recorder, clock, cotton covers, and other household stuff. With the changes in my family's financial situation, my parents showed their happy faces. Of course, I was also cheerful because I could help my family in someway to solve difficulties. My several brothers were withdrawn from monasteries and went to schools. Afterward, we built our house and bought an electric thresher, winnowing machine, tractor, television set, and a refrigerator. We changed to the richest family from the poorest one in Lhundrop. I loved to pay my respects to my parents. I gave money to my mother after I changed the denominations of all the money to 100, 50, 10, and 5 Yuan. I told to her that she could freely spend all of it to do whatever she liked, such as presenting to Buddha, or giving to others. I asked her not to be worried if she finished it because money was constantly coming. My mother was fond of helping others due to a benevolent and generous heart. She was used to giving a hand to different villagers. For instance, she often lent money to others to buy transportation tickets, or buy clothes. To those persons who could not pay it back, she was accustomed to smiling and then ending up all discussion. I believe that might be my family custom". When Tseten Namgyal was 19 years old, out of admiration for a famous painter ?C Mr. Jampel Wangchuk (the 8th descendant of Mandala painting), he went to Barkor Street of Lhasa to apply to Jampel Wangchuk to be his pupil to learn painting. It took him 28 years. The grandfather of Jampel Wangchuk was the famed painter of the Dalai Lama. Jampel Wangchuk disappeared during the Cultural Revolution but showed up again afterwards. In the early 1980s, he was invited to join the Archaic Relics Building Team of Lhasa Municipality, when it was formally established. Tseten Namgyal usually worked as carpenter by daytime, but learnt painting at night. He said his master was a kindly and lovely master. At the very beginning of his study, he had to take three years to only learn how to select the proportion of Thangka painting. 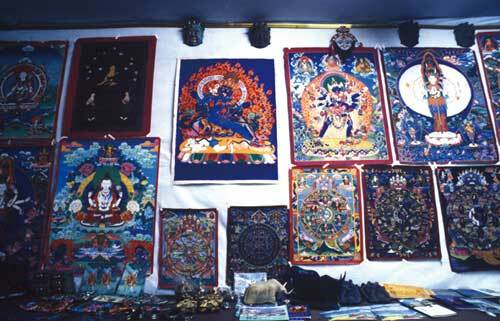 The first time he produced a Thangka was at his master's house. Having finished painting the Thangka, Tseten Namgyal was so excited he was speechless. His master often instructed him that the process of painting was a devout practice of meditation for the soul. The painting skills actually were ranked next to the process. Nevertheless, he said that he could understand those words only after he spent a long time to steel himself. He respected his master because the master was worth the name of teacher to take care of him. Whenever they arrived at the monasteries for painting, the master always began work immediately without rest in order to prepare for the next day. The master preferred not to disturb the monks and monasteries for any extra duties. Tseten Namgyal said, one day he and his master visited a monastery in Nagqu. He intended to take a break in the night to have a short tour of the downtown. But the master asking him to make up time and work on paintings, foiling his desire to sightsee. Tseten Namgyal was pleased to hear his master's morale-boosting words, such as striving for better painting, working hard, having a prosperous future and the potential for development. Once, Tseten Namgyal was drawing a Thangka in his home. Having watched aside of Tseten Namgyal for a long time, the master praised that Tseten Namgyal's painting as very much resembling what his grandpa did and claimed Tseten Namgyal might be his grandpa's reincarnation. Tseten Namgyal was always encouraged by his master beautiful words; indeed, the master rarely criticized him. After a while, Tseten Namgyal became a little bit famous in Thangka painting. His artworks integrate ancient and contemporary styles by taking traditional painting as the base. At the beginning of 1990s, he was constantly invited by reincarnations of Buddha from different monasteries to draw frescos and Thangkas; high-ranked monks from Nepal also invited him. In 1991, Chokyi Dewa Rinpoche, a Tibetan Buddhist reincarnation from Outer Mongolia residing at Nepal, came to Lhasa to look for a Tibetan painter. Tseten Namgyal was the one chosen as the painter. Within two years, Tseten Namgyal painted special pictures for Chokyi Dewa Rinpoche, such as "Sixteen Arhats Buddhism", "Four Deva Kings", "Great Dignity and Virtue", and "White Tara"; he also helped to draw eyes and brush golden powder for 1000 statues of Tsong Khapa. 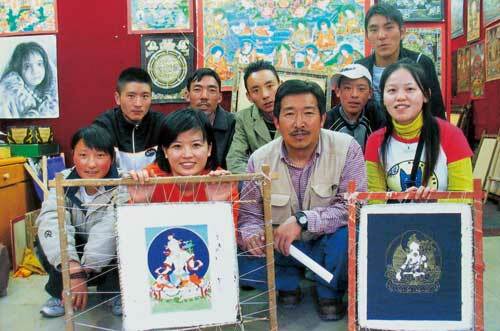 Tseten Namgyal told us, the Sharpa people in Nepal also liked to paint traditional Tibetan Thangka. When he just arrived at Katmandu, Thangkas hanging in the old shops profoundly impressed him, in particular those piling up in the shop windows for sale because there were none in a special shop only for Thangkas' painting and sales. Since then, he had started dreaming to have such art gallery shop in Barkor Street of Lhasa; by running this gallery, he could recruit young students who were fond of learning Thangka painting. Today, his dream has become reality. In recent years, the Thangka gallery shop of Tseten Namgyal is booming by hosting visitors from both home and overseas everyday. His Thangkas are famed in eastern Asia, Europe, Hongkang, Macro, and Taiwan. Rising to fame and fortune, he is still living in simplicity; he devotes his money to build bridges and support schools in his hometown. Last year, a student from a poor family was enrolled by a university but was without tuition fees. 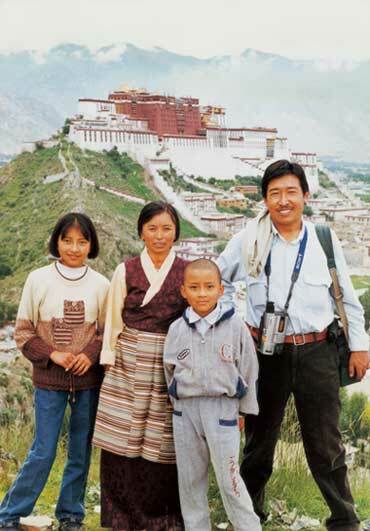 Tseten Namgyal heard about it and immediately brought money to the family. In order to encourage young kids, he has announced: "Anyone in the future who is enrolled by universities; I would like to fund him/her." Purchasing 10 thousand square metres of land in Lhasa, Tseten Namgyal set up a private school to teach Thangka painting with free tuition. The teaching curriculum also includes Chinese and English. At present, he is on the way to carry out his plan. We all sincerely wish he will successfully fulfill his dream in the near future.